Ya’ll know what happens in mid May when you have college aged kids. Your whole life gets turned upside down as you enter a three-month period when you have a new housemate, in particular, a ……..
………..all roll into one! I’m flabbergasted that with 28,000 such talented individuals in Columbia MO that the town has not rocketed to the top of the international charts in all the important arts and sciences. So, as we all know, no two children or siblings are the same. In fact, they can be polar opposites. Thank goodness for our house and how blessed will we be when son #2 goes off to school and comes back for that first summer break in 2014. We could gain a…..
…and then the alarm clock went off. I find myself in my home office, sitting at my desk and realizing that this is not my home office. 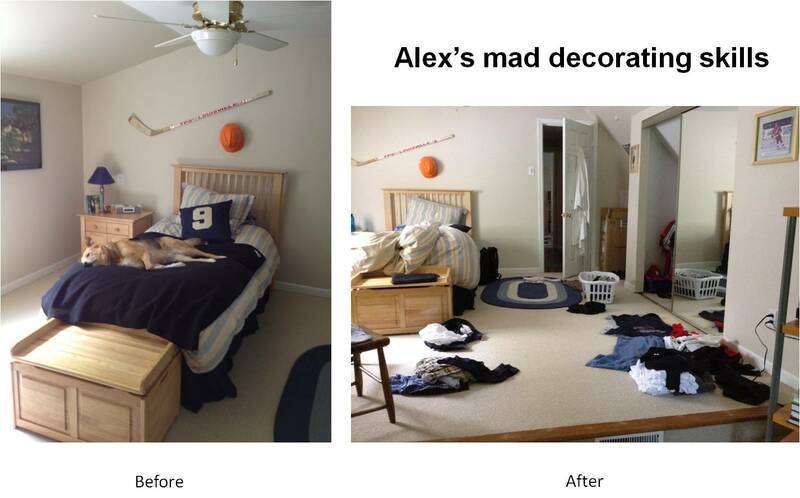 This is the bedroom of a talented young man who just completed his second year of college and headed for an International Finance and Econ degree. Along the way, he has made the Dean’s List, Honor’s College, entered the Business Fraternity, Studied in China, was accepted to the Cornell Leadership Program in the Truslake Biz College, and finally, was Treasurer of the Mizzou Ultimate Team. Son, every time I give you a lesson or lecture about hygiene, dirty laundry, dinner table etiquette, or curfew, remind me to look at this post and be thankful that all these bad habits and character traits came from your mother’s side of the family. Posted in Fun, History, Spiritual, UncategorizedTagged college kids, dirty laundry, home for summer, home from college, kid needs a summer job, messy room, Mizzou students, proud father, summer break, summer vacation, thankful parents. I can only echo your observations, after My daughter not coming home last summer, it is certainly an adjustment. I have found the challenge to be mine. Do I continue parenting my “children” or do I advise my peers? They think they are adults when they are away from home but boy how quickly they become children when crossing the threshold of the family home.